When I lived in Kansas, my dad asked if I could be at his house to sign for a delivery. He didn't tell me what it was for, and I didn't ask. When I pulled into his driveway on my way back from class, I saw a semi-truck parked on the street with a Porsche on the back of it. Yeah, I had to sign for a Porsche. Later, I chuckled when Dad told me he ordered it on eBay. I thought he was freakin' losing his mind. However, I think I've inherited the eBay gene that my dad has. I love eBay. Seriously. I mean, did you see the Jeep I bought on eBay? Maybe I'm losing my mind. 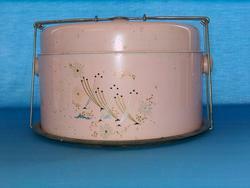 It helps that it's pink (which is a rule I apply to everything I covet), but vintage pie carriers are so fun. Why don't we have stuff like that anymore? I think I'm going to start collecting them. Yeah Scout, you should pay attention to that. That's pretty cute Erin. I love it! !